What today is the Chiltern Railway mainline was in 1975 something of a backwater. A single loco hauled train to and from Paddington plus a handful of morning DMUs to Marylebone and a two hourly off peak service. 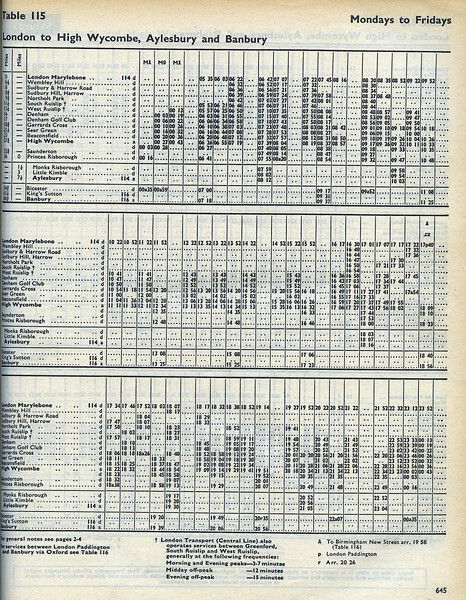 Journey time was, on average, just over 90 minutes in the bone shaking splendour of a class 115 DMU. The 115s were unique to the lines out of Marylebone. The two power cars in each four car set were equipped with a pair of 230 h.p. Leyland Albions, giving some much needed extra oomph for climbing through the Chilterns. But they did rattle. I recall a couple of days out to Banbury, primarily to drink Hook Norton beer, but also to ride in the DMUs. On the long single track section from Princes Risborough to Bicester the hunting motion of the 115s was very pronounced, especially if the driver was running at full speed (70 mph).